Some plays are just meant to remain on the stage and cannot translate into a medium that requires far more visual storytelling. However, Alan Bennett’s The Lady in the Van – who writes the script based on his own hit play – is one such example that transcends completely unscathed into film territory whilst refusing to shake off its more theatrical roots. It’s “mostly” based on a true story, with the film version(s) of Bennett (both by Alex Jennings) – in an interesting narrative device, there are actually two that share the screen, one designated the “writer” who jots down the events as they happen, and the other as the physical person who does the interacting with reality – encountering a particularly strange homeless woman. That woman is known as Miss Shepard (Maggie Smith), an elderly vagrant who resides in a dilapidated old van that she has parked on Bennett’s street in the early 1970s. Witnessing the ill-tempered hostility from both his neighbours and Miss Shepard herself, Bennett brings himself to offer her his driveway to park her van on a temporary basis – which, to his disappointment, is the beginning of even more troubles with the aged delinquent. The thing is, and this is where Bennett’s usual sense of dry wit takes centre stage, she ends up staying for roughly fifteen years despite her repeated instances that she’s dying, “possibly”. As you can imagine, this not only taking a toll on the real Bennett, but also the “writer” Bennett can’t help but be fascinated by her many episodes of cantankerous nature and murky past with a nearby nunnery. As the “writer’s” interest grows, so does ours; Miss Shepard is quite the character and it’s to the film’s credit that we understand both the growing irritancy of her extended residence and her darker and more heartfelt reasons for doing so. It’s a role that only someone like Maggie Smith could play, especially post-Downton where she was perhaps not quite as vulgar, and as ever she’s incredibly alluring to watch and still proving at age 80 she’s not going anywhere just yet, and we just have to accept that for the better. Whenever the titular lady is not on screen, though, Jennings is a fine substitute as both versions of Bennett, whom he respectively embodies just fine as the traditional stiffened comic foil. The entire device of there being two embodiments of the playwright on screen simultaneously does feel at times like it was lifted directly from a particularly clever stage production of the play – incidentally, director Nicholas Hynter was also at the helm for the original West End run in 1999 – but it’s actually done quite nicely here, using the same kind of editing room trickery that previously brought us two Tom Hardys for the price of one in Legend to enable Jennings to play both parts without the need of a second actor to be brought in. Some will undoubtedly call the film out for using a kind of theatrical device that doesn’t really have a place outside the stage, but it’s handled just fine here, so no need to kick up such a fuss. Bennett’s usual sly and stiff-upper-lip writing style is on full display here, and any fans of the playwright’s past work such as The History Boys – funnily enough, also adapted into a film not that long ago that Hynter also directed – will certainly find much to enjoy here. Some elements and sub-plots, such as one with an unnerving cameo by Jim Broadbent as an intimidating retired police officer, don’t exactly gel with everything else quite as fancifully, but the moments that stand out are more than worth the price of admission. A poignant scene nearing the film’s conclusion, which sees a music-phobic Miss Shepard confront her fears in a scene of understated beauty and affection, is one such instance of powerful storytelling and character development that is topped off by a grand performance by Smith who conveys every feeling and every emotion you’d expect out of a character in this situation. 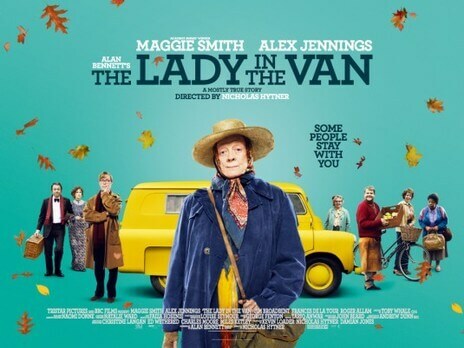 It will most certainly appeal to the loving UK crowd, and especially fans of both Smith and Bennett respectively, and rightfully so; The Lady in the Van is as much a crowd-pleaser as it is a funny and moving account of distorted reality, “possibly”. The Lady in the Van refuses to shake off its theatrical roots as it transcends into film territory, but because the adaptation manages to be just as effective with an outstanding performance by Maggie Smith as the tip of the iceberg, that can happily be overlooked.